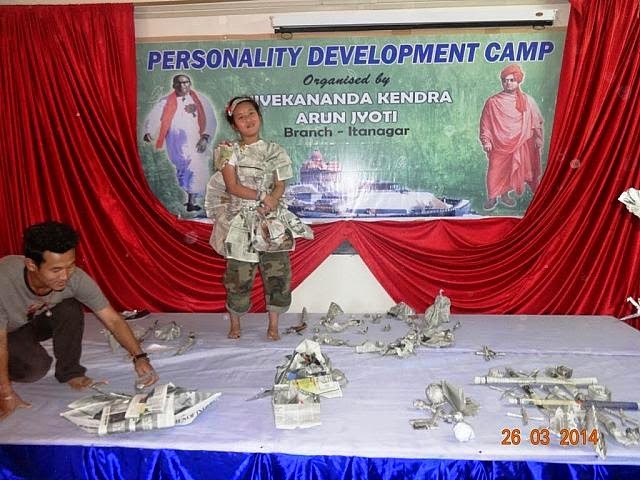 Vivekananda Kendra Arun Jyoti, Branch Itanagar organized a five days Personality Development Camp for the students of Class 8th to 12th from 24th to 28nd March at VKV Nirjuli, Itanagar. The main motto of the camp is to give future leaders a positive direction and to inculcate patriotism, Cultural value, self discipline and the attitude of Social Service, with the twine ideal of Vivekananda Kendra “Man Making-Nation Building” through the various sessions on Yoga, Drama, Tejas, lecture, concentration, memory development games & group discussion. A total of 90 participants from various schools took part in the camp. In all 7 sessions were taken on various topics for the personality Development of an individual. The Camp was introduced by Shri Taba Tatup, Prant Karyalaya Pramukh, Arunachal Prant. He welcomed all the participants in the camp and advised to take the benefit of such camps. He also exhorted the participants to carry forward the positive attitudes, good personalities and set an example in the society. Dr.Mika Umpo, Microbiologist & Head of IRL (for TB), Directorate of Health.Services took a session on “Time Management”. In his session he mentioned that punctuality is the mother of confidence as 'Time tides waits for none' and doing things as we desire in a selected time is called time management also said for today’s generation do the right thing in the right way at the right time. Shri C.C.Namchoom, Asst Professor, D.N College took session about “Patriotism in Action.” He stated that changing yourself for the betterment of your own society and Nation, Love your country. Shri Tara Dajam, Nagar Pramukh, Itanagar gave a lecture on the topic “Our Culture-Our life-Our Pride”. In his lecture he informed that the way of our life, culture is the set of belief system and it includes our attitude, systematic discipline. You should know our culture and must be faith on your in god, duty to preserve our culture in our day to day life. Should not be fallow converted rule.